Interested in obtaining a further qualification in Arts Management? UCD’s postgraduate course in Arts Management & Cultural Policy is the longest-running programme of its kind in Ireland (and one of the most established in Europe), with its roots in the Higher Diploma in Arts Administration from 1986. We have a competitively-selected class of 20-30 MA students every year, who come from across the artforms (music, theatre, dance, visual arts, film, cultural industries, etc). The MA programme is designed to prepare students for management careers in the arts, spanning the fields of marketing, education, artistic management, general management, local government, cultural policy, heritage — to name a few! We also welcome significant numbers of international students to the course each year, from Europe, North and South America, China, the Middle East — which makes for a wonderful and invigorating mix of perspectives and discussion. UCD’s programme is distinguished by its combination of coursework in business (marketing, finance, law, management); cultural policy (Irish and international comparative); independent research and work placement. The programme is full-time, running from September-early August, although the on-campus commitment is only Sept-Dec and Jan-March. We are also developing a part-time option — contact us for more details as it’s not up on UCD’s site yet! A link to the online application and more information is here. Interested to know where our alumni have ended up? 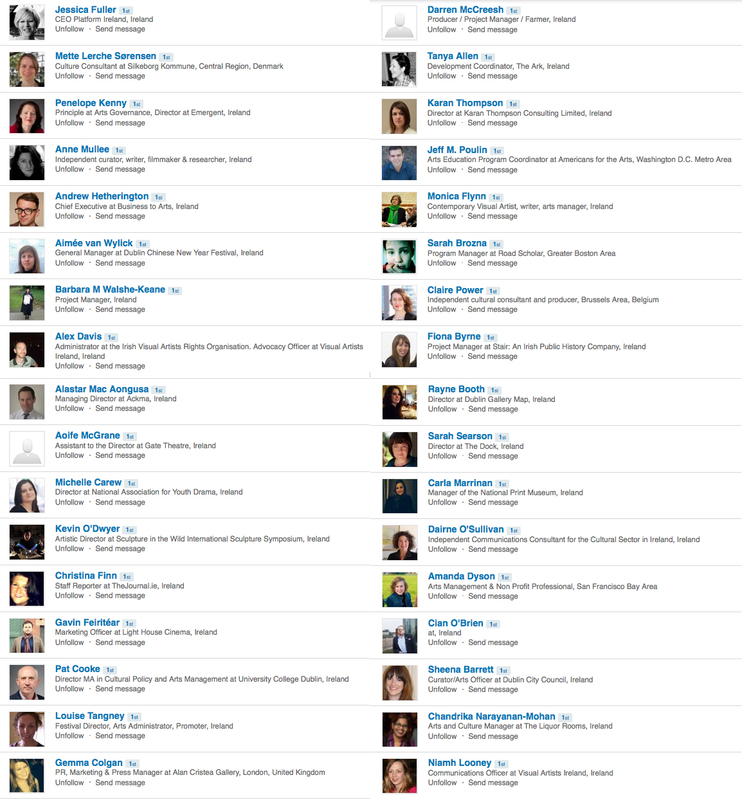 Click the image below for a expanded screen shot of just one part of our alumni Linked-In page — this gives you a sample of more than 500 graduates of the programme who are working across arts and cultural sector internationally. Students also have the opportunity to pursue M.Litt and PhD degrees on arts management and cultural policy topics. UCD also operates a structured PhD programme, which provides for independent research supplemented by some coursework, supported by a primary supervisor based in the School and an interdisciplinary doctoral panel. Feel free to email me if you’d like to discuss pursuing an MA, MLitt or PhD with the School, or have any further questions about our programme! For a list of other Irish postgraduate degrees and courses in related fields, see Frequently Asked Questions. * Please note: applications have closed for the 2017-18 class; we are accepting inquiries for 2018-19. However do contact us at any point should you have queries about UCD’s programme. Hello Emily! Thank you for all of the wonderful content. I am very interested in reading Sinead Carey’s thesis An Investigation of Social Inclusion and Public Participation in Ireland’s National Institutions but I am not able to locate in on-line. Can you guide me on where to locate it? Thank you!